Hila Ratzabi: "Barefoot Voice: The Insecurity of Language in Li-Young Lee's 'Behind My Eyes'"
in a childhood home, and returns to report. 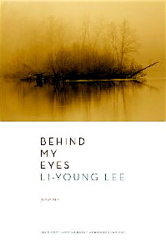 Li-Young Lee’s lustrous fourth book of poetry, Behind My Eyes (Norton, 2009), flickers, like fading lamplight, at the limits of language. The spiritual center of the book hinges on two axes: the horizontal (the body’s experience of, and in, time) and the vertical (the mind’s unbounded access to the realm of dream and, therefore, timelessness). At the point of their convergence, language attempts to give voice to the impossible duality of being. Lee is not only one of our best contemporary poets of the sacred; he is an authentic mystic, in the classical sense of the mystic who uses language to access a realm beyond language. Lee does not merely peer at the edge of the unknown; he enters it, as though it were a familiar room in a childhood home, and returns to report. Confounding dichotomy, Lee calls into question the division between beginning/end, birth/death, past/future, man/woman, body/mind. Borders melt; language opens. These poems approach the very edge of the ineffable, that which cannot be articulated. Though the speaker in one poem claims, aphoristically, “Thinking is good. / But living is better,” these are thinking poems, and the preceding lines serve more as a reminder than a statement of fact. Surreal, dreamlike, anti-logical, the poems in this collection are suspicious of flesh, and seem to spring out of a disembodied mind. In “Immigrant Blues,” the speaker, “confused about the flesh and the soul,” in conversation with his lover over the phone, asks: “Am I inside you?” This confusion, and subsequent conflation of body/soul, presumes that speaking to the lover is synonymous with physical intimacy. Dialogue between lovers dramatizes the constraints of speaking. A “he said/she said” motif drives many of the poems, deeply embedded in a Lacanian framework, in which gender difference symbolizes the tension between (male) speech and (female) speechlessness. “Sweet Peace in Time” enacts this difficultly. The male, obsessed with language’s precariousness, continually asks the female: “What if by … you mean … but I mean …” The dialogue reads like two simultaneous monologues in which the lovers talk at each other, unable to find a common language. The male does not trust language, stating: “To speak is to err. / Words name nothing. / There are no words,” and later, “We should give up / trying to speak or to be understood. / It’s too late in the world for dialogue.” Yet the female never questions language; she declares faithfully: “Home, speech is the living purchase / of our nights and days.” Speech, to her, relates to home and time — to being at peace with the physical world. The male, on the other hand, emphasizes the instability of speech. It reminds him of the power of death, characterized as a muting force: “Death creates a blind spot,” i.e., death instigates a temporary forgetting which negates the requirement to speak and muffles the voice that in life is bound to the body. Only in death will the man be freed from having to speak. Then, in the most Lacanian formulation in the book, the male states: “Man is a secret, blind to himself. / And Woman … Woman is …” The man associates Woman with pure being; this explains why she has no need, like the man does, to question language. She speaks out of true self-knowledge of her physicality; while the man, “blind to himself,” can never get past his awareness of death, and consequentially, focuses on the faultiness of speech. Enamored with the lure of language — its tease of meaning — the speaker in Lee’s poems sees language everywhere. This rapture with words figures most prominently in “Lake Effect,” where nature is equated with language. The “he said/she said” refrain from earlier poems morphs into the more personal “She said/I said.” The male and female speakers pile on metaphors: “She said ‘The lake is like an open book, / day like the steady gaze of a reader.’ // I said, ‘The day is a book we open between us, / the lake a sentence we read together …’ ” The male flips the female’s metaphors (transferring “book” from “lake” to “day”), extending and unfolding meaning. “Book” later becomes “voice,” and “The lake keeps changing its mind” (the lake a stand-in for the speaker). This changing mind ripples throughout the poem like shifting light on water: everything is a potential metaphor for something else; meaning is never stable. The tenuousness of communication embodied by male/female dialogue also comes into play in Lee’s depiction of mother/father figures. His formulation of an origin myth underlies his conception of the human being’s place in the world. Central to Lee’s personal genesis story, his portrayal of mother/father archetypes picks up on a trope from his previous collection, Book of My Nights (2001). The parental figures in Book of My Nights take on primordial significance, and they reappear in Behind My Eyes as part of a group of thickly layered symbols and metaphors of the speaker’s inner life. Like the male/female lovers, the parents signify a breakdown in meaning. The dysfunction of language becomes most apparent in poems that illustrate the immigrant experience. “Self-Help for Refugees” provides instructions on how to deal with the challenges of being an immigrant, of having a strange name, of “the burden of your own nostalgia and hope.” Part of immigrant nostalgia includes poignant, untranslatable memories: “And I bet you can’t say what language / your father spoke when he shouted to your mother / from the back of the truck, ‘Let the boy see!’ ” The mother tries to hide her child from the reality of history, but the father’s insistence that the boy “see” is expressed in a language the child cannot understand. From the beginning, the immigrant experience, as Lee depicts it, is linguistically fractured, as is his complicated relationship with his parents. In “Mother Deluxe” the speaker imagines his mother dealing cards in a game called “Memories from the 20th Century” whose “object is not to die.” The mother represents both the speaker’s actual mother and a godlike Mother that holds the cards to the game of life, some of which include “Dead Baby,” “Exodus,” “Eyes Snatched Away.” She symbolizes the hand of fate, an indifferent deity rolling the dice. Caught in this surreal game, where history gets handed out in sardonic sound bites, the speaker hovers at the border between reality and imagination: “Maybe this isn’t a game. / Maybe it’s the World Evening News,” and later, “Maybe this is a dream God is having / and somebody should wake Him.” Not only does the notion of reality collapse, by the end of the poem, time itself collapses: “Good boat, first boat, old boat, Mother, / my first night with you lasts nine months. / Our second night together is the rest of my life.” The speaker experiences his mother as an omnipotent arbitrator between life and death, who compresses life into an instant. The maternal association with death resurfaces in “The Mother’s Apple,” where the speaker emphatically utters: “I’m my mother’s apple and that’s that. / My sweetening draws death nearer, it can’t be helped.” But on the facing page a twin poem, “The Father’s Apple,” revises this thought: “Sweetness is a foretaste of words, / he says.” While the mother links the speaker to death, the father connects him to language. Between the two poems, only the father speaks; the mother remains in third person. “The Father’s Apple” begins: “He says I won’t always be an apple. Descended from a book, / that is my chief end, he says.” The unnecessary repetition of “he says” further stresses the father’s correlation with words; yet the son’s true ancestor is language itself, which transcends the gender distinctions/linguistic impairment over which Lee obsesses in this book. Death is the ultimate severer of language, yet for Lee, childhood, at least in theory, is its antithesis. Structurally, the book’s beginning and end connect like a circle, from the darkness of the womb in “In His Own Shadow” to the cryptic imperative in the final poem, “Station”: “You may board at either end of Childhood.” Childhood, in these poems, is as short as night (“And my childhood / lasted all of an evening”), and also as infinite. In “A Hymn to Childhood,” the speaker asks, sarcastically: “Childhood? Which childhood?/ The one that didn’t last?” as though there existed a second childhood that could last. Lee’s vision of childhood draws attention to the brevity of the body, the strangeness of time, and the omnipresence of death. Death inhabits these poems like a loyal dog reigned in by the sturdy leash of speech. The speaker of the opening poem narrates: “While all bodies share / the same fate, all voices do not.” All bodies die, but some voices (i.e., of poets) live on forever. Death is a given, but well-crafted speech is a gift. The birth-death loop spirals through the halls of these poems, flashing a light on the seeming absoluteness of endings. The theme of beginning and ending looms, yet in “Seven Happy Endings” the speaker admits to the beloved: “I who know nothing about endings. / I who am always at the beginning of everything. / Even as our being together/ always feels like beginning. / Not just the beginning of our knowing each other, / but the beginning of reality itself.” The lovers’ union is in a constant state of renewal, but that renewal signals a larger one. The lovers are a synecdoche of the cosmos, their love equated with “reality itself.” If reality extends from love, from the unification of male/female and the quality of timelessness, then Lee’s hesitant stance toward endings makes sense — the very concept of ending offends love. One cannot read these lines without being reminded of T.S. Eliot’s Four Quartets: “What we call the beginning is often the end / And to make an end is to make a beginning. / The end is where we start from.” For Eliot, the end and the beginning are one; for Lee, everything is in a state of constant beginning, and the end is an illusion, “Death’s blind spot.” Lee erases the boundaries between beginning and end, birth and death, past and future, hinting at a realm of continual creation that has no end, and is prompted by love. Like Wallace Stevens, Lee is a philosophical poet whose systems of meaning are often internally inconsistent. Yet, incongruity is part of their craft. Instead of espousing a coherent and logical worldview, both poets layer metaphor on top of metaphor to complicate meaning and to dismantle the possibility of linear interpretation. Each analogy does not line up with one thing only, but with a constellation of analogues that referentially point to further analogies, in an infinite regress of meanings. Metaphors shift like ghosts, transposed, unstable — like the poet’s vision of reality itself. Aware of the limitations of human knowledge, the speaker in Lee’s poems often readily admits to uncertainty. In the penultimate poem, “Dying Stupid,” the speaker repeats the phrase “What do I mean when I say…” and adds: “What can I say I know for sure?” Language is a necessary failure, and death highlights its inadequacy. Uncertainty is the most certain thing that can be expressed in language.